The soil bacterium Corynebacterium glutamicum is used for the industrial manufacture of products worth several billion euros annually. With a global market of about 1.5 million tons per year, L-lysine is one of its most important industrial products. L-lysine is mainly used for its beneficial properties as additive in animal and human nutrition. In addition, targeted genetic modification of C. glutamicum enables the synthesis of other added-value products such as the protective substance ectoine and the polymer block diaminopentane. This wide range of products has substantially boosted the economic importance of C. glutamicum. Here, we work on tailor-made strains of C. glutamicum for the industrial production of chemicals: with new methods of systems biotechnology and synthetic biotechnology, we generate next generation producers with superior properties. Hoffmann, SL, Jungmann, L, Schiefelbein, S, Peyriga, L, Cahoreau, E, Portais, JC, Becker, J, Wittmann, C (2018) Lysine production from the sugar alcohol mannitol: Design of the cell factory Corynebacterium glutamicum SEA-3 through integrated analysis and engineering of metabolic pathway fluxes. Metab. Eng. 47:475-487. Link. Becker J, Schäfer R, Kohlstedt M, Harder BJ, Borchert NS, Stöveken N, Bremer E, Wittmann C (2013) Systems metabolic engineering of Corynebacterium glutamicum for production of the chemical chaperone ectoine. Microb. Cell. Fact. 12:110. Link. 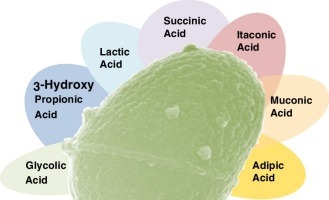 Kind S, Becker J, Wittmann C (2013) Increased lysine production by flux coupling of the tricarboxylic acid cycle and the lysine biosynthetic pathway - metabolic engineering of the availability of succinyl-CoA in Corynebacterium glutamicum. Metab. Eng. 15:184-195. Link. Becker J, Zelder O, Häfner S, Schröder H, Wittmann C (2011) From zero to hero - design-based systems metabolic engineering of Corynebacterium glutamicum for L-lysine production. Metab. Eng. 13:159-168. Link.